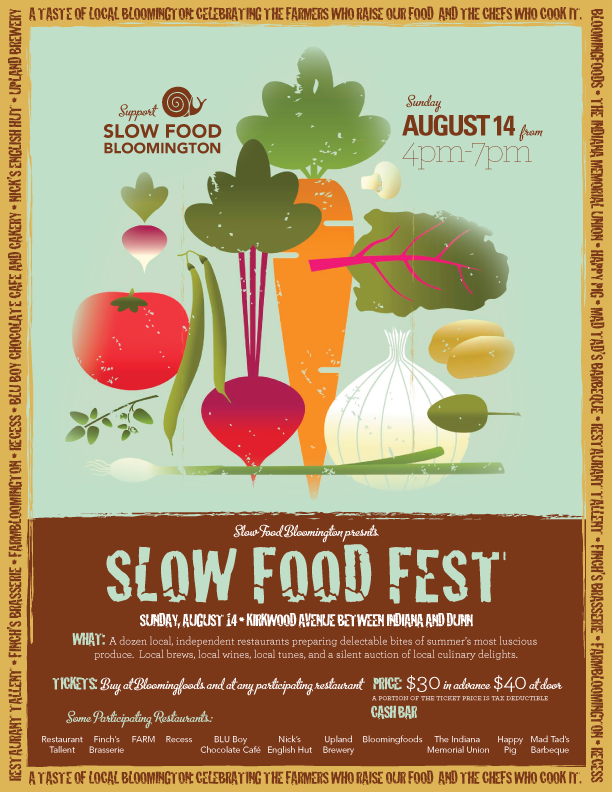 Another wonderful Slow Food Bloomington event coming up Sunday, August 14, from 4-7. Slow Food Fest — August 14th, 4-7 p.m., Kirkwood Avenue between Indiana and Dunn. Participating Restaurants Include: Tallent, Finch's, FARM, BLU Boy, Nick's, Feast, Upland, One World, Mad Tad's, IMU, Happy Pig, Recess Indy, Recess Indy, Bloomingfoods, Brown County Coffee. Tickets — $30 in advance (Tallent, Finch's, B'foods); $40 at the door, cash bar.